CHARLOTTESVILLE, Va., April 13, 2019 /PRNewswire/ -- Today Virginia's 2019 Commemoration, American Evolution™ announced the winners of the American Evolution Innovators Cup, which was held at the Tom Tom Summit & Festival. The student teams representing Virginia Tech were chosen as the grand prize winners of the second annual competition, and each will receive a cash prize of $20,000. The competition is designed to challenge Virginia students to develop innovative solutions that address issues facing both the Commonwealth and the nation. 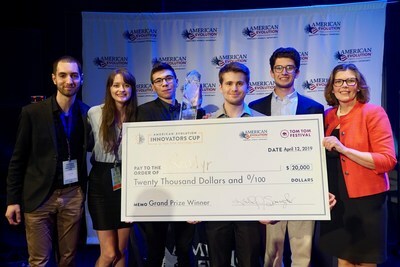 From left to right - Members of the Rendyr team Martin Angst, Callan McGill, Kaelum Hasler, Liam Lawrence, Reid Holbert and American Evolution Executive Director Kathy Spangler at the American Evolution Innovators Cup. 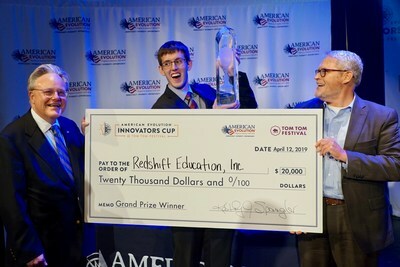 From left to right - Ben Dendy, 2019 Commemoration Steering Committee; Mark Carman, a member of the Redshift Education, Inc. team; and Kevin Hall, Executive Director of the Virginia Lottery at the American Evolution Innovators Cup. "On behalf of the 2019 Commemoration, we are thrilled to recognize the next generation of innovators in the Commonwealth by recognizing the winning teams from Virginia Tech," said Kathy Spangler, Executive Director of 2019 Commemoration. "The Innovators Cup represents the entrepreneurial and civically-motivated solutions that students are inspired to take on to address the pressing challenges facing the Commonwealth, and the entire nation. We look forward to seeing how these ideas will be implemented in real-life scenarios." The Virginia Lottery provided the trophies for the Innovators Cup. The 6-member student team from Virginia Tech was selected as the grand prize winner of the Social Impact Challenge, which asked participants to reimagine the high school of the future and design a concept addressing a need or gap that exists given today's high school model. Virginia Tech's winning submission, "Redshift Education, Inc.," by Mark Carman, Maria Jernigan, Kiran Bagalkotkar, Taylor Carroll, Jooyoung Whang and Vince DiNardo, builds project-based learning in virtual reality by synthesizing the best practices from around the world and codifying them into their libraries of VR lessons. In addition, in the Social Impact Challenge category, a team from the University of Virginia placed in second for its submission, "The Pick-Me-Up Box." The team consisted of UVA students Kurien Thomas, Sasha Duckworth, Srijay Kasturi and Emily Smith. Finalists teams included: "InternLab," University of Virginia; "MetaCTF," University of Virginia; "ReinventED's Reinventing High School Kit," University of Virginia; and "Computer Science Curriculum for Richmond Public High Schools," Virginia Commonwealth University. The judging committee for the Social Impact Challenge included: Henry Hipps, Deputy Director of the Education team at The Bill & Melinda Gates Foundation; Tiffany Henry, Program Officer at the Winthrop Rockefeller Institute; and Karen Jackson, the Former Secretary of Technology for the Virginia Commonwealth. A team from Virginia Tech also received the top award in the Innovators Cup's Commonwealth Challenge, which consisted of student-developed concepts on the commercialization of invention and research and traditional pitches. Virginia Tech's winning submission "Rendyr," by the 6-member student team of Kaelum Hasler, Martin Angst, Elijah Hodges, Liam Lawrence, Callan McGill and Reid Holbert, maximizes access to rapid prototyping by eliminating the constraints of conventional machines with the introduction of Optic, their portable laser cutter. A team from the University of Virginia placed in second for its submission, "Minimally Invasive Spinal Technology, LLC." The student team included Alexander Singh, Rohit Rustagi, George Vithoulkas, and Eric Taleghani. Finalists teams included: "PurPics," University of Virginia; "Riley," University of Virginia; "HeartSaver," Virginia Commonwealth University; and "Keydet Cap Aero," Virginia Military Institute. Judges who selected the winner of the Commonwealth Challenge included: David Hall, Partner at Rise of the Rest Seed Fund; Navin Thukkaram, Lead Investor and Board Member of SkyKick; and Jason Feifer, Editor-in-Chief of Entrepreneur magazine, and host of the podcasts "Problem Solvers" and "Pessimists Archive." This year, 41 student teams representing 17 Commonwealth colleges and universities and two high schools were selected to participate in the Innovators Cup semi-finals. A full list of the Innovators Cup semi-finalists is available here. The 2019 Commemoration has partnered with notable Virginia institutions and national partners like the Tom Tom to inspire local, national and international engagement in the themes of democracy, diversity and opportunity. American Evolution is commemorating formative events that occurred in 1619 Virginia, including the first representative legislative assembly in the New World, the arrival of the first recorded African in English North America, the recruitment of English women in significant numbers to the Virginia colony, the first official English Thanksgiving in North America and the entrepreneurial and innovative spirit of the Virginia colony. A full schedule of American Evolution programming, upcoming events, and educational initiatives can be found at: https://www.americanevolution2019.com/events/. The 2019 Commemoration, American Evolution™, highlights events that occurred in Virginia in 1619 that continue to influence America today. Featured programs, events and legacy projects position Virginia as a leader in education, tourism and economic development. American Evolution™ commemorates the ongoing journey toward the key ideals of democracy, diversity and opportunity. Dominion Resources is an American Evolution Founding Partner and Altria Group and TowneBank are Virginia Colony Partners. The Tom Tom Foundation is a nonprofit organization that champions entrepreneurship, creativity, and innovation in America's small cities. Tom Tom's flagship event is a weeklong Summit & Festival that takes place in conjunction with Thomas Jefferson's birthday each April. Tom Tom welcomed over 20,000 attendees to Charlottesville, VA in 2018 and has channeled nearly $3.1 million to new ventures since its inception in 2012. Learn more at www.tomtomfest.com.